She patiently waited until after church, then told some of the girls she wanted them to come over but couldn’t convince me. Guess who then came running over to talk to me! And any ideas on who’s coming over tonight?! I guess I got what I deserved. It may have been a little slow on ITF this week, but things have been hopping here at headquarters. I’ve been working with a client in the studio so I haven’t had time to nurture the blog. Instead, I’ve asked ITF’s all-time favorite commenter to once again write a guest post! Thanks Ag. I see Tom hasn’t been posting much of late. Tsk. I might call him a slacker, only I am to blame. If you remember WAY back in the beginning of ITF time, Tom posted a CD review from a ladies trio called Heartbeat. That trio contains me, the faithful ITF supporter, and two of my sisters. It all came into being when Tom heard our CD and was either thrilled about what he thought we COULD be, or just ragingly compassionate for the mess that he did find, and began to beg, plead, grovel, and bribe for us to let him to do our next recording and work as both an engineer and a producer. I concluded that if someone is begging to work with you, either they really need to get out more or they really smell potential. I chose to believe the latter. So, I’m at Tom’s house. Well, not at this exact moment in time. Tom gave me my homework assignment and I am seeking to fulfill that at the house of Jewel’s parents. AND if I don’t have all the work done that he expected to be done in the music department by the time we get to his house tonight, he must bestow upon us an extra measure of grace because I am spending valuable minutes doing this. YAWN! We’ve been working long hours. We’ve been floating, wallowing, framing, stacking, tuning,……all in the world of music. It’s been fun, frustrating, hilarious, enlightening, and exhausting. I will say of Tom, the man is relentless! BUT he is as patient as he is relentless, so it works, and no one has yet had an anxiety attack, broken into hysterical sobs, or begun to twitch nervously, so it’s all great. Mrs. ITF is just the greatest thing ever. We all laugh hysterically and Tom just sits there. Poor man, he misses out on the whole world of female humor. Jewel is refreshing to have around and creates much needed diversions, insisting that we need a break. We love her!! OH MY! Okay, so we are all sitting around the table eating supper. It’s Tom against four ladies. We are all farm girls. We have all milked cows. Tom, obviously has not. When the conversation turns dairy, he confidently charges in and asks if we all talk about “Number 12 who was down, or number 25 who has a dry corner.” We laughed (my sister said that “laugh“ is to mild of a word…but for lack of better…..). To those of you who know as much (or as little) as Tom, suffice to say that a cow does NOT have a “dry corner.” We’ll leave it there. Yes, all is well in the land of ITF. I know. I’ve been there. The Official Iced Tea Forever.com Dinner (though not billed as such!) was sold at auction for the ridiculously overpriced sum of $35 per plate! Our church fundraising auction was a big success and a lot of fun too. I love auctions. And to all my skeptics, no, I don’t realize any profits from this! It all goes for the building fund cause. Overpriced as it was, the ITF meal tickets were a downright bargain compared to my buddy Kyle’s (he’s an esteemed ITF commenter too) seasoned pork tenderloin dinner! My wife and I wanted tickets to it, so I got in position to bid when it came up on the auction block. I got in a bid or two, but was quickly put out of the running. It moved way beyond my league! Fortunately for me, my brother-in-law was the high bidder and gave me and my wife a couple tickets. What a guy! He definitely gets a comp ticket to the ITF dinner. It turned out that (unbeknownst to him) it was my other brother-in-law bidding him up! Oh yeah, the price. Try $80 bucks a head. Looking forward to it Kyle. I’ve been thinking about this for awhile. I’m not quite done, but the bulk of it has been formulated. Iced Tea Forever.com is proud to announce our Official Dinner. The ITF Official Dinner menu reads something like this: Barbecued chicken, cornbread, stuffing, spinach salad, a California-blend baked vegetable dish my wife makes, and of course the ever present iced tea. I’m not sure on the dessert yet, maybe that should be rice krispy bars! It’s late and I’m tired and doing this off the top of my head, so I hope I didn’t miss anything. I’ll update it if I did, and this whole thing is a work in progress at this point anyway. Tomorrow is the fundraiser auction for our church, Living Water. Several families are selling meal tickets, and guess who has joined their number with an offering based on the above menu. That’s correct, Mr. and Mrs. Iced Tea Forever! You know when something incredible happens in your life and afterwards you can’t imagine what things were like before? That’s the way you’re going to feel about this. I told you I was going to give you my recipe for marinated barbecued chicken and here it is. And of course a bunch of chicken. I always used boneless skinless chicken breasts. 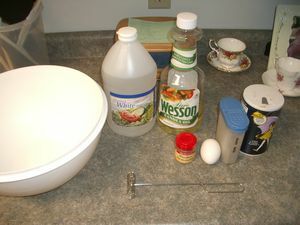 Beat the egg and dump in the vinegar. Don’t forget the pepper. Stir well. This is optional, but I like to tenderize the chicken. A neat trick my Mom taught me is to cover it with saran wrap so it doesn’t splatter all over the kitchen when you whack it. Usually the pieces of chicken are pretty big, so I often cut them up. Ladies will mostly prefer smaller pieces too. The kitchen shears your Mom gave you works excellent for this. I should have cut this particular batch in half, I had plenty of marinade. This recipe is good for lots of chicken, I think I had a mere three pounds in this example. It will handle a lot more. It doesn’t need to be marinated very long. If tenderized, a half an hour is probably sufficient. Maybe an hour if not. After the chicken has fermented for an adequate time, toss it on the grill!! This particular evening Jewel’s friend Kendra (from nursing school) was over for supper, and she took a few of these pictures for me. I think I usually cook it over medium heat, it doesn’t take real long. Make sure you don’t over-cook it, the meat will dry out somewhat. It’s vital to check the meat right there off the grill! Make sure you’re hitting the right cooking time. Rip off smallish (or not) chunks of meat with your tongs and shove it in. Here I’m demonstrating my patented method of chicken-testing. Remove the pieces as they finish cooking and place in a covered dish. Try to stay out of the dish otherwise, or there won’t be any meat left for supper. The finished product, with a small spinach salad on the side. And iced tea, of course. Try it, you’ll be glad you did. On my way to he dentist. I did it, dook boh at once. Man, they seem ed to hit pretty fast. i’m kindsa loosey-goosey feeling, can’t relly hold still very well. It is a pretty nice felling, I must say though. We’ll see what happens in there, there sposed to really come into their own in an hours or so, it’s mbeen maybe 20 minutes since I took them. I am happy, ifeel calmy at peace with everybody. And happy. But still steady as a rock, incomplete controal of my fackalties. I jogged out to the car and masterfully drove the short distance to the dentist’s office. We traded a few wisecracks and he started in on his tortures. His assistant agreed. Interesting. I remember being pretty tired but I never thought I slept. Dent thought I was out for up to half an hour. That stuff hit fast, but it left quick too. I think next time I’ll two valium and one halcion. PS Not sure what was up with all the typos, I’m usually pretty well on top of that kind of stuff. In my illustrious financial history, I have used my credit cards to the point of meltdown. Purchases of hundreds of dollars were commonplace, no one batted an eye about my reputability, transactions sailed right through with nary a doubt or suspicion. Today I went to the dollar store. And since I despise wasting perfectly good cash money paying for stuff, I whipped out the trusty Mastercard. My bill was a whopping $3.71. My lands. Did she think I was going to fraudulently charge $3.71?!! Frightened that my swindle was about to be exposed, I calmly (as much as I could manage) showed her my fake drivers license. Appeased, she let me go and approved the transaction. I thought I had it bad (referring to my last post), which I did. But my wife just got off an 18-hour shift. Today I violated my conscience. And I didn’t just bend or fracture it, I shattered it. I guess I really made it worth my while. I feel bad about it, of course, but at the same time I’m struggling with the notion that I was manipulated somewhat by circumstances. That I was maybe justified in doing it because of threatened retribution. But how important do you consider your convictions if you cave and they topple at the first sign of opposition? They certainly aren’t growing stronger! Tribulation certainly isn’t working patience! And this was something I have stood up valiantly for in the past, triumphantly even. It’s something I hold dear to my heart, I’ve nurtured a great passion for it for many years. But this time I was strongly opposed, I was informed in no uncertain terms what the consequences would be. And the consequence would have been disciplinary action at work, to some degree putting my job in jeapardy. Does that mean my job is more important to me than my conviction? I cry “no,” but the evidence says “yes.” I don’t know what to think. For years I have passionately stood up for mankind’s inborn right to have Saturday’s off work. Shouldn’t even be a question, you get Saturday off no matter what. I fondly remember many an affirming conversation I had in years past with Mrs. Darling’s brother about this God-given right of all men. We vehemently agreed that 8 hours a day was enough and Saturdays were off limits. The Den of Iniquity has been going through very difficult times lately. Production has been greatly hindered by varied and sundry obstacles, and overtime has shot through the roof. Rarely does management demand that we work a Saturday, and if they do it’s usually only until noon. Not so today. They demanded attendance, and they demanded a full production day. What they got was a day’s production in about a day and a half’s production time. It was almost evening before I finally punched out (we begin at 6 a.m.), this was the longest day I had ever logged in service for the Den on Iniquity. So anyway, that’s why I’m struggling with body, mind, spirit, and emotions.